Organization – establishes cooperation and builds consensus by convening community partners and stakeholders around a comprehensive revitalization strategy. Zuni Pueblo MainStreet is a designated 501(c)(3) non-profit corporation, governed by a Board of Directors with standing committees in each of the Four Points. An executive director/manager coordinates the work of the organization, which includes solicitation of public input, fundraising, planning and implementing projects and events, recruiting/retaining volunteers, publicizing ongoing progress and ensuring that Zuni Pueblo MainStreet has the capacity and resources to realize the Zuni community’s vision for MainStreet. 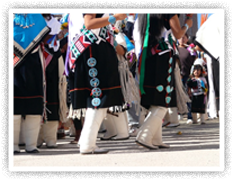 Promotion – helps to create a positive image of Zuni Pueblo MainStreet through branding, advertising, retail/business promotions, marketing campaigns, and hosting events and festivals (such as the annual Zuni MainStreet Festival). Promotional activities communicate Zuni Pueblo MainStreet’s unique characteristics, renews community pride, and improves consumer and business investor confidence. Design – involves improving the physical appearance of the Zuni Pueblo MainStreet corridor. Physical improvements along Zuni Pueblo MainStreet create a more visually appealing atmosphere and convey a positive message about what our community has to offer to its residents, visitors and potential business investors. Design activities can include storefront renovations, building rehabilitations, revamping window displays/interior merchandising for local businesses, improving signage and pedestrian safety, and enhancing the streetscape and public spaces. By improving on all of these aspects, Zuni Pueblo MainStreet can enhance and eventually preserve the appearance, character, quality and function of MainStreet and the Zuni community for generations to come. Economic Vitality – improves the economy by strengthening Zuni Pueblo’s existing assets while diversifying its economic base. Zuni Pueblo MainStreet can accomplish this by retaining and expanding existing businesses and attracting market-appropriate new businesses that align with the community’s vision. Zuni Pueblo MainStreet, in collaboration with local government and tribal entities, identify proposed new uses for vacant or underutilized properties (land or buildings) and establish financing tools to support new business or property development. Economic Vitality efforts enable MainStreet programs to improve the economic health and vitality of their respective districts by responding proactively to the needs of local consumers and renewing the draw of their district as a potential commercial center.